As the use of e-money gains popularity in Japan, versatile FeliCa RFID readers that support multiple forms of electronic currency are popping up in convenience stores and vending machines, making it easier for users to pay with the swipe of a phone. 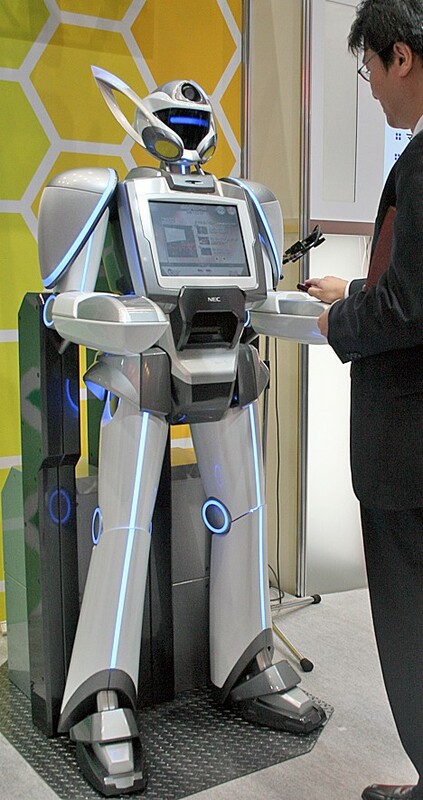 Electronics giant NEC is jumping in on the action with a FeliCa payment terminal modeled after a life-sized android. 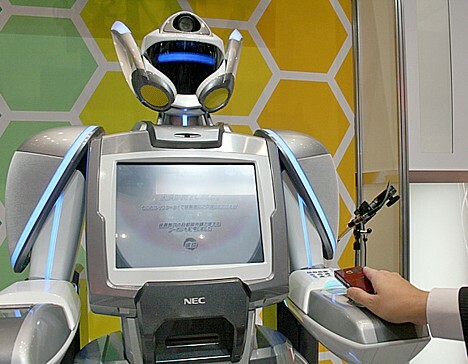 The robot -- a prototype that NEC demonstrated at the recent iEXPO 2008 trade show in Tokyo -- incorporates existing technology, which means a finished version can be produced and deployed at short notice. NEC hopes to land it a job at an amusement park selling entrance tickets to visitors with FeliCa-enabled wallet phones, also known as osaifu keitai. To pay the robot, users simply select the appropriate e-money icon on the robot's chest-mounted touch screen panel and then swipe their phone over the reader/writer embedded in the left hand. The robot can also be programmed to transfer electronic coupons and other data to the user's phone when payment is made. Other features include a camera system that can work with face recognition technology to identify and profile park visitors. If asked to do so, the robot can recommend specific attractions based on the person's apparent age and gender. It is unclear whether any theme parks have expressed interest in hiring the robot. If not, NEC could easily equip it with fingerprint scanners and put it to work at immigration counters to gather biometric data on foreigners in Japan. Tourists would love it. Do these fellows look old enough to smoke? Yes indeed, say Japan's cigarette vending machines that use face-recognition technology to determine the age of the purchaser. Just two weeks after a major sports paper reported that magazine photos could be used to fool vending machine age-verification cameras, an even more surprising flaw has come to light. 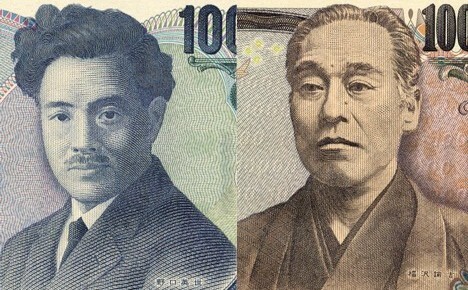 The portraits of Hideyo Noguchi and Yukichi Fukuzawa printed on the 1,000-yen and 10,000-yen bills can be used to trick the high-tech machines, according to a new report on the Sankei Shimbun website. 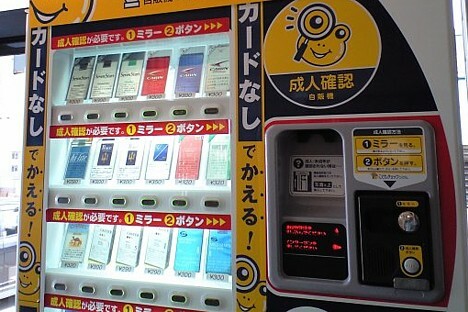 On July 1 -- the day that Japan's cigarette vending machine age-verification system was rolled out nationwide -- Sankei reporters in Tokyo went out in search of machines equipped with age-verification cameras. They found that these machines treated them as adults and allowed them to purchase cigarettes when they showed the portrait of Yukichi Fukuzawa (the renaissance man and Keio University founder who appears on the 10,000-yen note) to the vending machine's camera-embedded mirror. The machines also reportedly sold cigarettes to the portrait of Hideyo Noguchi (the notable bacteriologist who discoveredcontributed to the understanding of syphilis), which appears on the 1,000-yen note. Once the machines approved the sale, the reporters then used the same money to pay for the purchase, making this all-in-one technique even more convenient than the recently discovered magazine photo trick. Ironically, news of this latest discovery comes just days after the Finance Ministry officially approved the use of face-recognition technology to determine the age of vending machine users. Sankei contacted the Finance Ministry's Tobacco and Salt Industries Office about the flaw they found. A surprised official responded by saying, "This is the first we've heard of it. It's a big problem if it's true." The official said he would immediately notify Fujitaka, the vending machine manufacturer who developed the age-verification camera system. Fujitaka is reportedly in the process of upgrading its face-recognition technology so that it can more effectively distinguish photographs from real people. Of Japan's more than 500,000 cigarette vending machines, around 4,800 (less than 1%) are equipped with age-verification cameras. 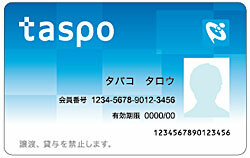 The rest are outfitted with readers that check Taspo age-verification cards, which are available to anyone of legal age who applies (though they have yet to become widespread). The vending machines that use age-verification cameras allow people to purchase cigarettes without a Taspo card, as long as they look older than 20 years of age. 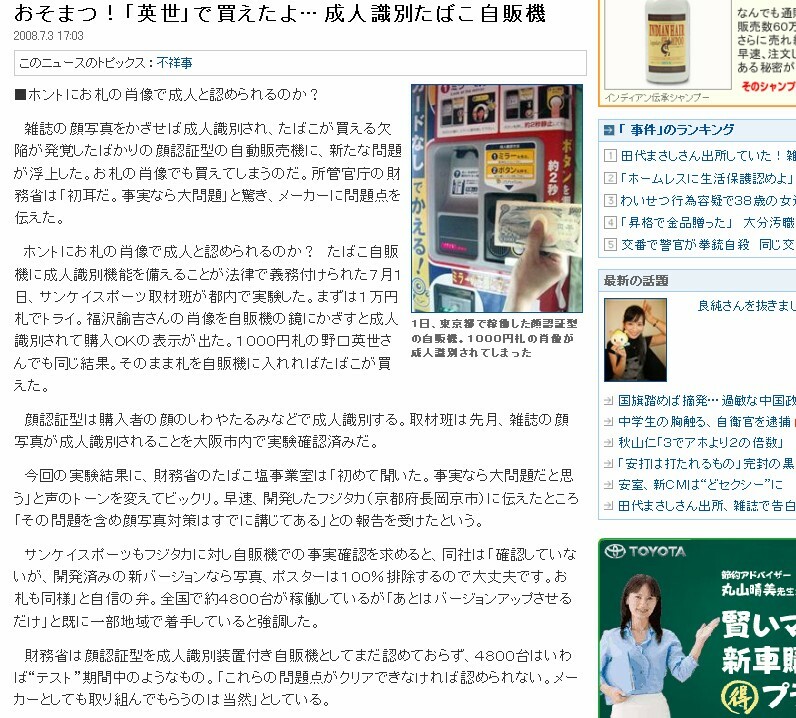 With the full-scale rollout of Japan's cigarette vending machine age-verification system just around the corner, a Sankei Sports news reporter has confirmed the existence of a minor flaw: magazine photos can be used to fool the age-verification cameras on some machines. As part of the age-verification system, most of Japan's 570,000 cigarette vending machines are being outfitted with RFID readers that check the purchaser's Taspo age-verification card. Smokers without a Taspo card can now either buy their cigarettes in person over the counter or use one of 4,000 special machines equipped with face-recognition systems (these machines do not require Taspo cards). More face-recognition machines are on the way, according to vending machine manufacturer Fujitaka, who developed the face-recognition hardware. The face-recognition machines rely on cameras that scan the purchaser's face for wrinkles, sagging skin and other signs of age. Facial characteristics are compared with a database of more than 100,000 people, and if the purchaser is thought to be well over 20 years old (the legal age), the sale is approved. If the purchaser looks too young, they are asked to prove their age by inserting a driver's license. According to Fujitaka, the machines are 90% accurate. Fujitaka admits that people may, on occasion, be able to fool the age-verification cameras with photographs -- but only for the time being. The company is now working on a more advanced system that will make sure each face belongs to a real human, but they are unable to say when these new machines will be put into place. To anyone planning a visit to Japan, please note: YOU WILL BE TREATED AS A POTENTIAL TERRORIST WHEN YOU ARRIVE. As many foreign residents in Japan are already painfully aware, a new law that takes effect November 20, 2007 will require non-Japanese people entering the country to be fingerprinted and photographed in the name of fighting terrorism. Over the past few days, Ministry of Justice officials at airports across Japan have been staging promotional events and showing off the new hardware that will be used to collect the fingerprints and scan the faces of the estimated 5 to 6 million foreigners potential terrorists that enter the country each year. The devices, which proudly bear the NEC logo, consist of a monitor, two fingerprint readers (one for each hand) and a camera that captures mugshots. The devices are being installed at immigration counters nationwide so that you can be fingerprinted and photographed while immigration officials ask you the usual questions about the purpose of your visit and your intended length of stay. Your biometric data will then be stored for an extended period of time in a database, which law enforcement officials will somehow use to thwart terrorist attacks. Under the law, called the Immigration Control and Refugee Recognition Act, all non-Japanese citizens -- except for state guests, visitors using diplomatic or official passports, people under the age of 16, and special status permanent residents (such as Korean nationals who grew up in Japan) -- are to be treated as potential terror threats and must be fingerprinted and photographed when they enter the country. The new law makes Japan the world's second nation to fingerprint and photograph its foreign visitors. The United States was first. Japanese lawmakers, who passed the law with little public debate, conveniently overlooked the fact that Japanese people -- not foreigners -- are the ones with a proven history of committing terrorism in Japan. Japanese citizens have been responsible for every terrorist incident in modern Japanese history (i.e. the Aum Shinrikyo gassing of the Tokyo subways in 1995). The fact that foreigners have no record of committing terrorism in Japan calls the government's true motives into question. At the very least, if lawmakers truly believe that blanket fingerprinting and face-scanning is the way to prevent terrorism, then why not require all people in Japan -- citizens and non-citizens alike -- to keep their fingerprints and other biometric data on file? Without a doubt, NEC and other companies that develop biometric system hardware and software would be more than willing to supply the government with the equipment they need for the job. Regardless, for now at least, the xenophobic government seems content with invading the privacy of millions of law-abiding foreigners who live, do business, visit and study in Japan each year. Over the past few years, Hitachi's finger vein authentication technology -- which identifies individuals based on the unique pattern of blood vessels inside their fingers -- has appeared in everything from ATMs and computers to building entrances and cardless payment systems. Hitachi's latest development puts the biometric security technology inside the car steering wheel and couples it with a system that allows the engine to start only for drivers whose finger vein patterns the vehicle recognizes. While providing an extra layer of security against car theft, Hitachi's steering wheel finger vein authentication system also works to improve in-vehicle comfort when used with seats, mirrors and air conditioners that auto-adjust according to the preferences of the driver touching the wheel. Furthermore, the finger vein reader, which is small enough to be embedded inconspicuously on the back of the steering wheel, can be used as a programmable multi-purpose switch that lets the driver perform different functions with different fingers. The driver could, for example, use different fingers to turn on the stereo, open the sunroof, and operate the navigation system -- all while concentrating on the road and maintaining a natural grip on the wheel. The company also sees great future potential for the steering wheel finger vein reader as cars become smarter and equipped with increasingly complex IT-based functions. In Hitachi's vision, the reader will one day be used with on-board electronic payment systems that literally keep you in the driver's seat while making secure payments at drive-thrus, as well as with services that let you pay for and download music while on the road. Hitachi first brought their finger vein authentication technology to automobiles in 2005, with a keyless car door lock that checks finger veins and opens only for the vehicle's registered driver. The technology, which Hitachi originally developed in 1997, relies on image sensors and near-infrared light passing through the finger to measure the vein patterns inside. Each individual finger has a unique pattern of blood vessels, much like a fingerprint, which can be used as a form of biometric identification. A model vehicle equipped with Hitachi's steering wheel finger vein authentication system will be on display at the 2007 Tokyo Motor Show from October 27 to November 11. NEC Corporation has teamed up with Aida Engineering to develop a briefcase-sized DNA analysis system that allows police to perform comprehensive DNA testing at crime scenes in as little as 25 minutes. NEC is calling the device the world's first portable all-in-one DNA analysis system able to handle all DNA testing processes from extraction to analysis. Designed specifically for law enforcement officials and planned for release in 2008, the system measures 50 x 40 x 20 cm (20 x 16 x 8 in. ), making it small enough to be carried to crime scenes or other locations where quick DNA analysis is required. Nowadays it typically takes about one day to complete a DNA analysis (one week if re-testing or confirmation is required), and a variety of different equipment is used to perform the separate processes. NEC's new portable system, on the other hand, can perform all the processes within the same unit -- and it can do it all more quickly. In particular, the compact unit can be used to: (1) take cell samples, (2) extract the DNA, (3) perform polymerase chain reaction (PCR) amplification to generate copies of the DNA, (4) perform electrophoresis to measure the spacing between DNA bands (to create the genetic fingerprint), and (5) perform short tandem repeat (STR) analysis to create a unique genetic profile for the individual. In addition, the compact unit dramatically speeds up the processes -- particularly the repeated heating and cooling processes performed in PCR amplification -- making it possible to complete the entire DNA analysis in 25 minutes. The system will be exhibited at the 18th International Symposium on Human Identification scheduled for October 1 to 4 in Los Angeles, and at a meeting of the Japanese Association of Sociology of Law scheduled for November 8 in Tokyo. On July 24, Hitachi announced the development of a biometric cardless credit payment system, called "finger vein money," which allows shoppers to pay for purchases using only their fingertips. The company plans to begin field testing the finger vein money in September. Finger vein money relies on Hitachi's finger vein authentication technology, which verifies a person's identity by reading the pattern of blood vessels in his or her fingers. These blood vessel patterns are unique to each individual, much like fingerprints or retinas, only they are hidden securely under the skin, making them all the more difficult to counterfeit. Hitachi's finger vein authentication technology is already being used to verify user identities for ATMs, door access control systems and computer log-in systems in Japan and elsewhere. In the finger vein money system, consumers first register their finger vein pattern data with the credit card company. The data is then entered into a database along with the individual's credit account information. Later, when shoppers want to pay for something, they simply go to the cash register and place their finger in a vein reader, which uses infrared LEDs and a special camera to capture a detailed image of their vein structure. The image is converted into a readable format and sent to the database, where it is checked against the records on file. When the system verifies the identity of the shopper, the purchase is charged to the individual's credit account. Hitachi's three-month field test, which is set to begin in September, involves 200 Hitachi employees volunteering to use finger vein money at the company cafeteria and shops in the Hitachi System Plaza Building located in Shin-Kawasaki. If all goes well, Hitachi -- who is conducting the test with the cooperation of major credit card company JCB -- plans to expand the trial system to all of its company buildings. As a cardless payment system that promises the ultimate in convenience and security, finger vein money could help contribute to the disappearance of credit cards and all the anxieties associated with their loss and theft. 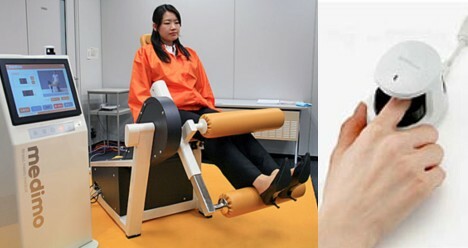 When that day comes, we may only need to worry about losing our fingers. On July 19, electronics giant NEC announced it has developed the world's first automated border control system that uses facial recognition technology capable of identifying people inside their automobiles. The system is already in operation at checkpoints on the Hong Kong - Shenzhen border. Built around NEC's NeoFace biometric face recognition system, as well as NEC's electronic passport technology, the system is designed to boost the speed and efficiency of Hong Kong Immigration Department operations by allowing residents with microchipped national ID cards to remain in their vehicles while automated cameras verify their identities. Hong Kong residents aged 11 or over are required by law to carry a national ID card (HKID), and the recently issued "smart" IDs are embedded with chips that contain biometric and personal data. The system works by first reading a vehicle�s license plate as it approaches a border gate. Because each vehicle in Hong Kong is registered to an individual driver, a simple automated database check determines who the driver should be. 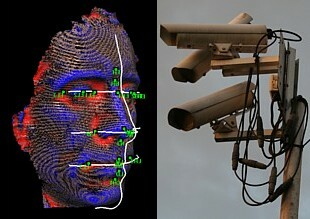 Next, the cameras scan the face of the driver and a database search is performed. If there is a match, the immigration process is completed and the gate opens, allowing the vehicle to pass through. For now, NEC's setup only works with truck drivers, but coming improvements promise the ability to identify up to 8 passengers per vehicle. The cameras have been installed at 8 of the 40 border gates on a new road connecting Hong Kong and Shenzhen, with all 40 gates expected to be upgraded by August. NEC eventually hopes to develop a face recognition system so quick and accurate that it would eliminate the need for fingerprinting.